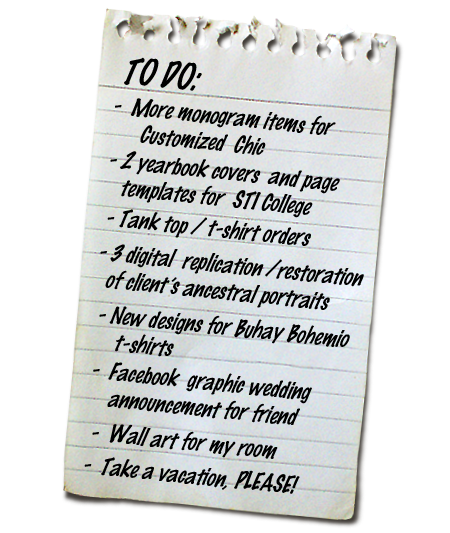 Buhay Bohemio: Where's the "Free" in Freelancing? Where's the "Free" in Freelancing? It looks like you guys won't be seeing any new post in this blog for the rest of April. I'm busy again... well, I'm always busy. I have a pretty long list of things to do. What you see above is just the ASAP page. Times like these I kinda miss working in an office, you know, for a company that only needs me 8 hours a day, 5 days a week. Being a freelancer, I tend to work even on weekends and holidays just to get the job done the soonest, so I can get back to the work that has more to do with my long term goals. Also to get back to some non-profitable creative stuff, that always seem more fun to do. But after the completion of a "survival" project, another one comes along. It really is a good thing but it sure feels draining. Trouble is, and you might find this amusing, that when I'm working on a graphic project I get chained to my old laptop for days and I can no longer bring it anywhere because the battery doesn't work anymore, and it now uses an external monitor and keyboard. So yeah, I become like a prisoner in my own room, that I've been decorating to make it look less of a ward. Believe me, a beautiful ambiance does help. Well I'm going to Puerto Galera with my peers on May 1st. I think I will need this 3-day vacation more than anything else!